One straight from the Scania newsroom that I thought you may find interesting, even for you non Scania fans! Within short, Scania, in collaboration with the Swedish National Road and Transport Research Institute (VTI), will start trials with so-called platooning on the 520-kilometre route between the Swedish cities of Södertälje and Helsingborg. “Reducing aerodynamic drag by drafting comes naturally to fish, birds, cross-country skiers and cyclists,” says Tony Sandberg, Systems Pre-Development Manager at Scania Research and Development. If the second truck is 25 metres behind, its drag is reduced by 30 percent and the third truck in line will benefit from a 40-percent drag reduction. The leading truck will also take advantage of platooning by reduced adverse rear aerodynamic effects as the tailing vehicle “pushes” the truck ahead forward. In the first phase, the convoy will only take advantage of the existing Adaptive Cruise Control system, which controls the speed of the vehicle relative to the speed of the vehicle ahead. The gap between trucks will be 2–3 seconds, which corresponds to 40–60 metres. The trials will only be conducted on two-lane motorways. At present, four to five tractor and trailer units depart twice daily from Södertälje en route to Scania’s production unit in Zwolle, The Netherlands, with engines, gearboxes and axles. These trucks are operated by the Scania Transport Laboratory, which tests and evaluates vehicle characteristics and performance in commercial road haulage. “We plan to coordinate the departure of these trucks and form a platoon as soon as we reach the motorway,” says Anders Gustavsson, Managing Director of Scania’s wholly owned subsidiary. Following a few months of operations, VTI will evaluate the trials through a questionnaire to drivers. How is their work situation affected and how do they perceive the effects on the surrounding traffic situation? Unless serious issues arise, Scania will move to the next phase in August 2012 when the distance between trucks will be reduced to one second or 20–25 metres, still using present-day technology. Once again, drivers will have the opportunity to state if they find this shorter distance acceptable. If that proves the case, Scania is prepared to take a major step towards the future. The trucks will then drive with a gap of merely 0.5 seconds or 10 metres. Present systems do not support distances this short and Scania will therefore employ wireless communications between platooning trucks. If the first truck brakes, all the following trucks will simultaneously and automatically brake. In simulations, Scania R&D has demonstrated a fuel savings potential of more than 10 percent with compact platooning. “We’re now interested in ascertaining whether these substantial savings can actually be achieved in a real traffic environment,” says Project Manager Anders Johansson. How is surrounding traffic affected? 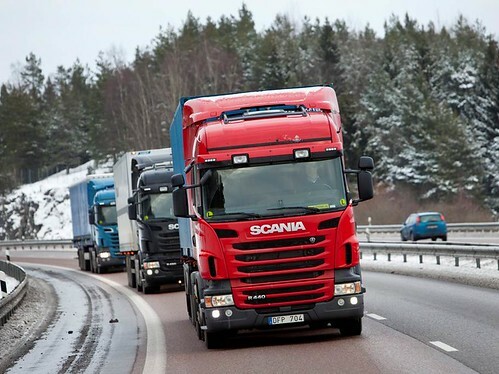 How do drivers feel about platooning?” Scania has held consultations with the Swedish Transport Agency in planning these trials. It is clear that broad-based cooperation in society is needed to develop future transport systems. “Nowadays, we speak about transport solutions rather than just products,” says Senior Vice President Lars Stenqvist. “Many of these solutions cannot be accomplished by Scania alone. We need national demonstration projects, such as the platooning trials.” In the Discovery Channel video series “Earth 2050: Driven by Design,” platooning is presented as new smart road technology that saves time, fuel and money. This entry was posted in Scania by truckbloguk. Bookmark the permalink.